Every year on April 20th, here at Ignite and across the cannabis world, we celebrate 420 (check out what we’re doing this year!). But who wants to wait an entire year? That’s why every day, when it turns 4:20, lots of people spark up – and yes, it turns 4:20 twice a day (wink). It’s also become shorthand for people who describe themselves as pot-lovers – you 420 friendly? Of course you are. But, do you ever wonder how the number 420 ever got associated with weed to begin with? There are many rumors floating around– and some of them are downright hilarious! For starters, the real reason has nothing to do with Bob Dylan or the number of active chemicals in pot, nor does it have anything to do with tea-time in Amsterdam (lol). No, the answer lies with the Waldos, so let’s move on to where’s Waldo – and who the hell are the Waldos. The Waldos were a group of California high school kids who hung out outside their San Rafael school by a specific wall – hence the name “Waldos”. The Waldos were student athletes and would have to wait until practice was over before they could hang out. And guess what that time was? In the fall of 1971, the Waldos learned of a crop of cannabis plants grown by a member of the Coast Guard who could no longer keep an eye on them. All they knew was that it was located in the nearby Point Reyes Forest – and so at least once a week at 4:20pm, these kids would get together by the school’s statue of Louis Pasteur, light up, then go scour the forest. Steve Capper was one of those original Waldo kids and he has fond memories. He told the Huffington Post that; “We would remind each other in the hallways we were supposed to meet up at 4:20. It originally started out 4:20-Louis, and we eventually dropped the Louis.” So there you go; if you want pure originality, you can call it 4:20-Louis, referencing the statue they’d meet under. They never found the legendary cannabis plants but they had coined a new term – “4:20” – which they used as code to talk about smoking weed without anyone else knowing. So far, so good; but how did everyone else start calling it that? It actually took the Grateful Dead to get the phrase known worldwide. The Waldos had a handful of connections to the Dead. One of their fathers managed the band’s real estate purchases. One of their older brothers was good friends with Dead bassist Phil Lesh. And it was while backstage watching the band play at Winterland that they used the term 4:20 whenever they passed a joint between them. The stage is now set for how that phrase went viral. 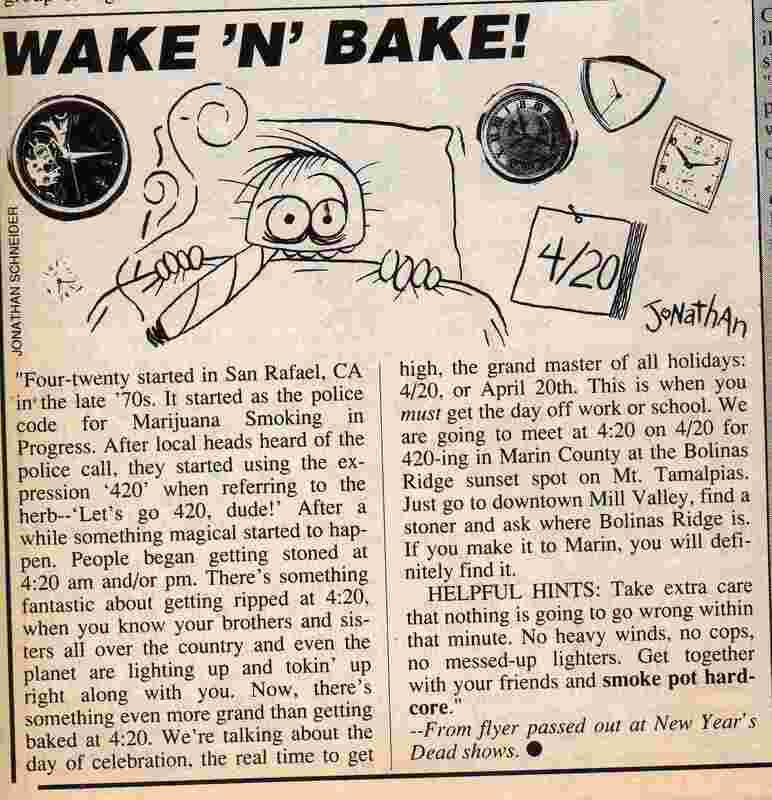 A reporter for High Times, Steven Bloom, was at a Grateful Dead concert in Oakland in 1990 (yes, it took that long!). He was handed a flyer that read “We are going to meet at 4:20 on 4/20 for 420-ing in Marin County at the Bolinas Ridge sunset spot on Mt. Tamalpais.” It was thanks to High Times’ coverage of the event that 4:20 became the phrase we all know and love. The number has cropped up in a number of ways since. You can find it in pop culture- in the 1990s cartoon Rocko’s Modern Life where a clock read 4:20; in the cult classic film Pulp Fiction where many of the clocks on display are all set to 4:20; and, one time, even a contestant on The Price Is Right would only bid using numbers that had 420 in it. It also found its way into the legislature; the 2003 medical marijuana bill in California was named SB 420.